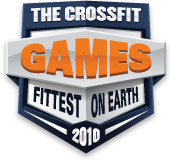 Paul Flores finished 3rd in the Masters Competition of the 2010 Games. We caught up with Flores to get to know what he thinks about Masters, maintaining strength with age, and life outside of CrossFit. For those of you just getting to know him, here’s some background. Paul Flores has spent ten years in the fitness industry, at one point owning a non-CrossFit gym and working as a personal trainer. In recent years he made the switch to CrossFit. Now, he and his wife, Tina, own CrossFit East County in El Cajon, California. Together, Tina and Paul have five kids ranging from thirteen to twenty three years old, two dogs, and a cat. When he’s not training for CrossFit competition or being ‘dad,’ Flores says he loves to relax with a guitar or go down to the ocean to surf. At Masters, Paul deadlifted 405 pounds and powered through Fran and Nancy in 4:54 and 14:43, respectively. Given his exceptional performance, we were curious, how has Flores maintained his strength as he aged? Part of the answer may be that he has remained active throughout his life, albeit with an endurance sport focus. 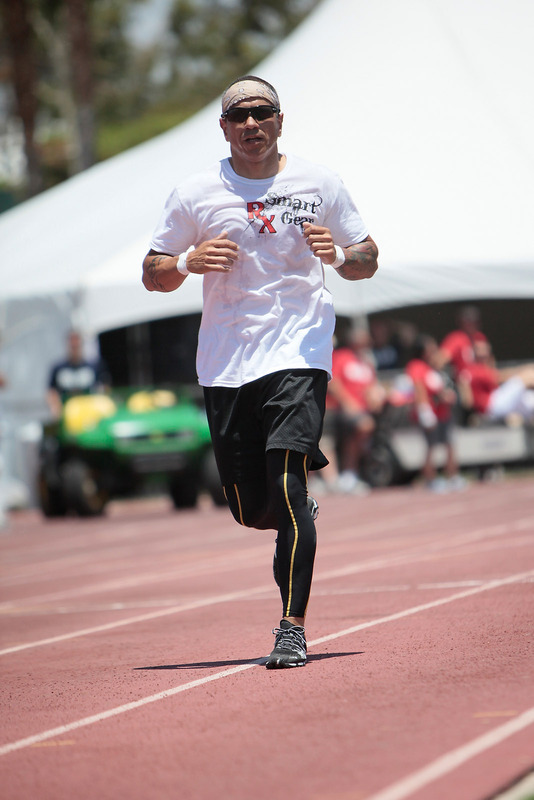 Between college and now, Flores has competed in over 25 triathlons, several half marathons, USCF bike racing, and one half Ironman. In addition to endurance sports, he has lifted weight for the entirety of his adult life. As he gets older, he has seen his approach to weightlifting change. To the extent that he describes the difference between his weightlifting in the past and now as like “night and day.” In the past, he would spend a couple hours per day in the gym power lifting and body building, now he fills his week with two-three days of olympic lifts and one day with a strength-biased metcon. Now, he programs recovery. For older athletes, Flores says that “recovery and injury prevention become a big factor... recovery has to be just as important as training in your programming." Paul trains three days on one day off, and tries to get as much sleep as possible, including a nap every day. He keeps his programming malleable. If he pushes exceptionally hard on a WOD for where he is in a training cycle, or does not feel that he has recovered from a session, he will do an alternative lighter WOD the next day. Sleep, listening to his body, and keeping alternative "back-up" workouts in mind are key parts of his training. Flores is already looking forward to the 2011 Games. To prepare, he has been training and testing himself at unsanctioned CrossFit competitions whenever possible. He has done two already, and is training for the next. He has gotten a PR “some way or another every month” using a standard CrossFit training regimen of strength training and metcons. We asked him if he’d like to see anything different at the 2011 Masters. He replied that he thinks what Dave Castro pulled off at Carson “was nothing short of AWESOME.” But, like Women Masters champion Laurie Carver, he wishes “ the Masters workouts were more skill intensive and there were more workouts for us.” Paul believes that by changing the format of Masters to include more events, conditioning would play an even larger role. 18 January 2011 / 7:03 p.m.
Way to go Pablo! I know you'd rather avoid the spotlight but that's gotta be hard when you ARE the beacon! You know that your followers at CrossFit East County will follow you into the trenches anywhere! Stay healthy, stay focused and stay uncompromising. 2011 is sure to be a fun year! 18 January 2011 / 7:09 p.m.
Paul Flores is a true class act. Always humble and focused. In the special operations community I once was a part of we hold accomplished solid operators with his demeanor to the highest regard. There is a solid 6-8 ft swell building tomorrow Paul. Get on it! 18 January 2011 / 8:16 p.m. Thanks Paul for setting high standard for us and living life of balance and integrity. Keeping pushing and I hope to have another opportunity to compete with you at the Games again this year. 19 January 2011 / 5:25 a.m. I am a 54 year old man, and Paul has been coaching me for almost four years. My level of fitness is astonishing, and I credit Paul's approach to training for the 50+ crowd. He is an amazing coach and athlete who has profoundly changed my life. 19 January 2011 / 9:17 a.m. I want to be like Paul when I grow up! 19 January 2011 / 3:26 p.m. I am proud to have Paul as my coach and mentor. Paul and CrossFit East County have improved my life more than I ever could have imagined. As I turn the corner into my 40's, I look forward to maintaining the kind of lifestyle Paul does. 19 January 2011 / 5:06 p.m.
Congratulations Paul! You deserve it! I'm Proud to know you, your such an Inspiration!! Keep up the good work and Good Luck with whats to come. 19 January 2011 / 5:46 p.m.
19 January 2011 / 7:52 p.m.
Great insight from a TOUGH competitor! Thanks, Paul - you are an inspiration to all CrossFitters. 19 January 2011 / 8:13 p.m.
Hey Curley, will you cut it out?? It's hard for us to hate you when you're so damn classy all the time!! How do we start a West Coast-East Coast rivalry when everybody is so damn classy and respectful to each other? 20 January 2011 / 7:33 a.m.
60+ senior here....can't tell you how much my overall fitness and quality of life have improved under Paul's guidance. Paul is an awesome coach and a true friend. 20 January 2011 / 10:11 a.m.
Way to go Paul! Jim, Halle, Brady and I are proud to call you our trainer and our friend. You have pushed us all to become better athletes, especially the kids! Keep up the good work! Go CFEC! 23 January 2011 / 2:11 p.m.
25 January 2011 / 8:44 p.m.